As autumn settles in, comfort foods are suddenly on the mind. And I’m starting to crave all things orange! To satisfy both cravings, I had a pasta party featuring this shrimp pasta with a smoky, cheesy butternut squash sauce. This recipe is not super heavy – there is no cream in the sauce. Richness comes from bacon and parmesan cheese, but the bulk of the dish is nutritious butternut squash, spices and lighter shrimp. A few tablespoons of nutritional yeast amp up the cheese factor and bring lots of B vitamins along for the ride. Use whole wheat pasta for extra fiber. I boiled a squash from my neighbor’s garden and pureed it myself in this shiny new Cuisinart Elemental 8-Cup Food Processor (new to stores June 2014). The Shrimp Council and Cuisinart have partnered to give one away to a lucky reader – scroll down to win one for yourself! It’s a bit smaller and much lighter in weight than the one we have, so it’s actually easier to use. 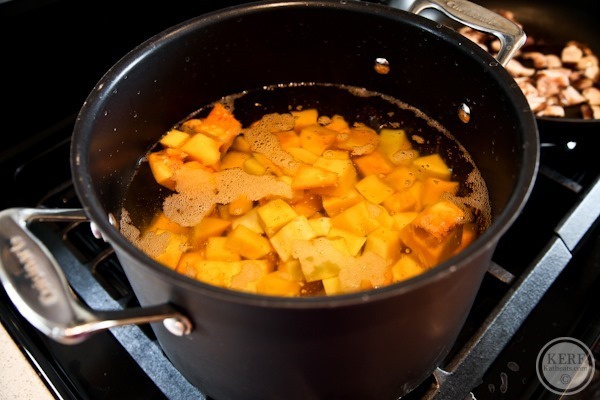 Boil 2 cups of cubed squash for about 15 minutes until fork tender. To get the recipe going, cook your bacon and shrimp one after the other in a skillet, allowing the shrimp to cook in the bacon grease so they get nice and crispy! 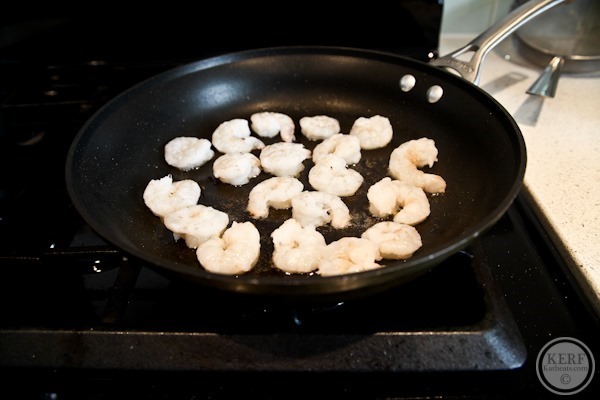 Don’t overcrowd the pan or you’ll get wimpy shrimp – I cooked mine in batches. Be sure to pat the shrimp dry so they aren’t too water logged when you add them to the bacon grease! Once both are cooked, set aside. Cook your pasta – ooo la la! I went with fresh pasta for extra pizzazz but you could easily use dried. Just be sure to scale back by about a third, according to Real Simple! 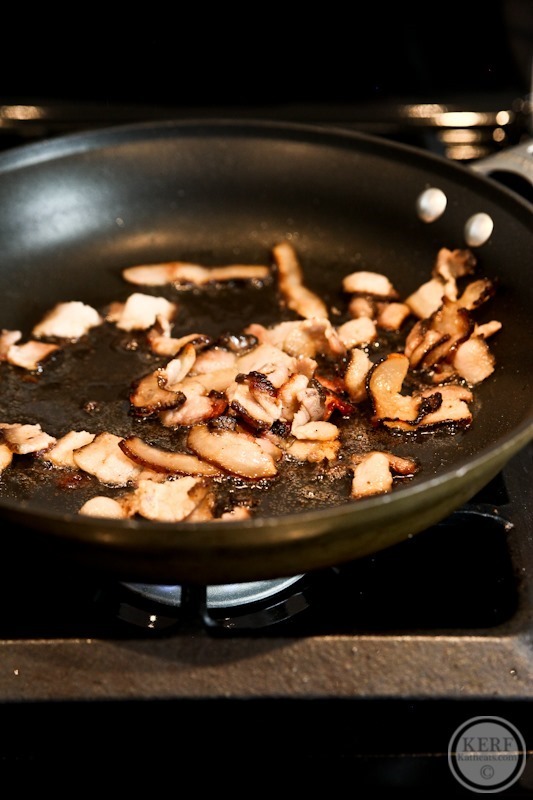 Turn your skillet heat back to low and add in your garlic. 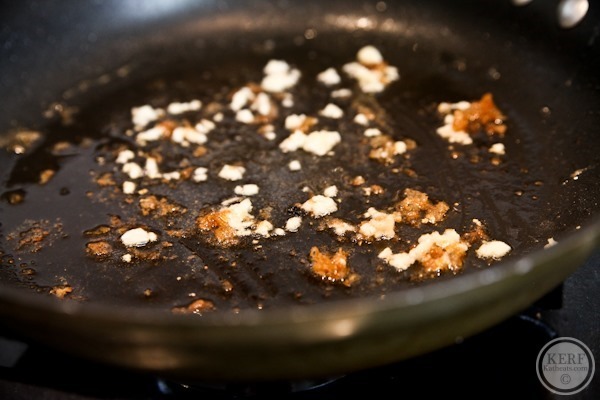 I didn’t wash my skillet so that the bacon and shrimp brown bits would provide lots of flavor and the fat still in the skillet would serve as my cooking oil for the garlic. 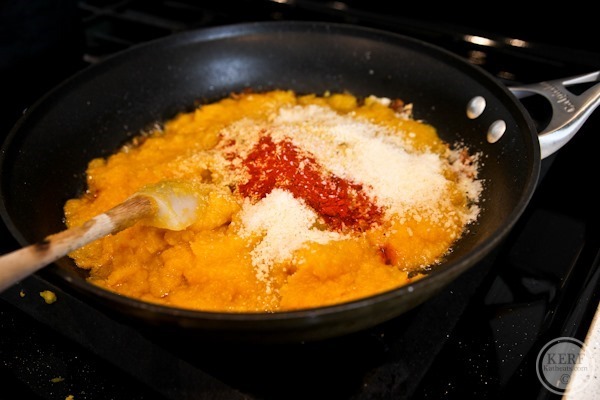 Once your garlic is fragrant and beginning to brown, add 3 cups of butternut squash puree, plus your parmesan, nutritional yeast, smoked paprika, nutmeg, salt and pepper. And gently mixed in the shrimp and bacon. 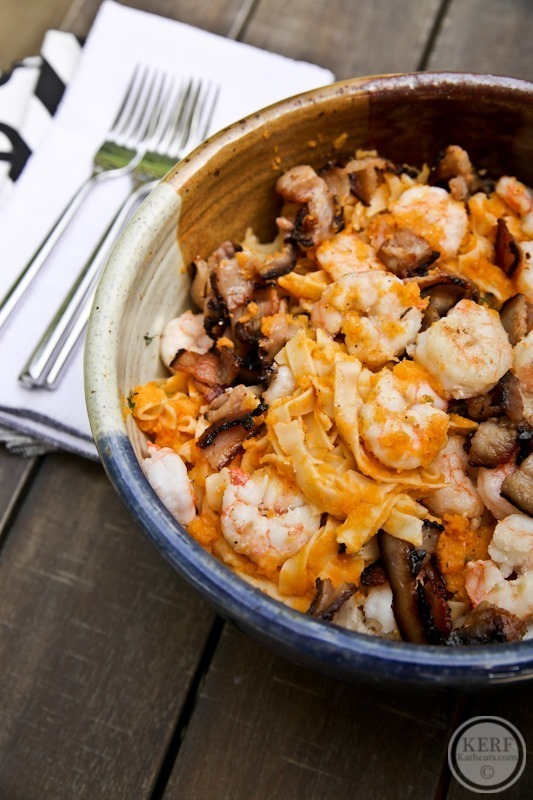 And there you have yourself a fancy pasta dish loaded with cheesy squash sauce, succulent shrimp and crispy bacon! This pasta is as comforting as it comes, but there's no cream involved. 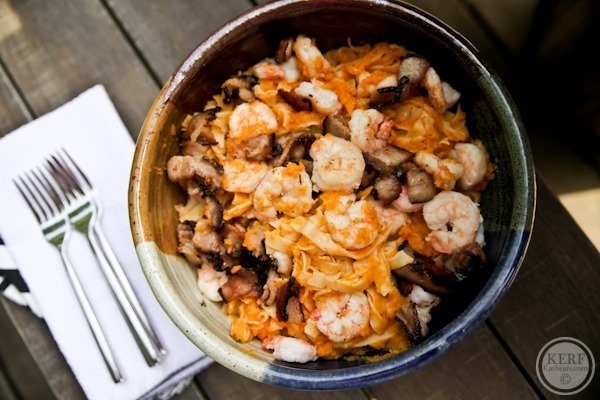 Bacon and Parmesan add richness and shrimp and butternut squash lighten things back up. 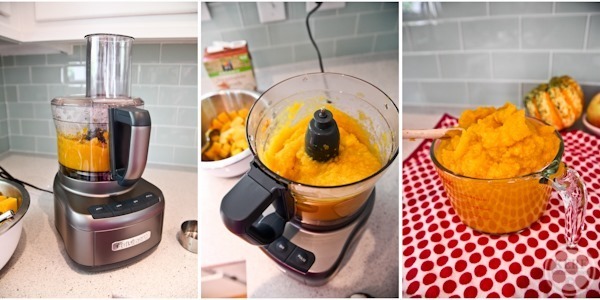 Use canned butternut or make your own puree. Serve with a side salad! First boil squash for about 15 minutes or until fork tender. Then drain and puree in a food processor or blender (being careful of steam) with about 3/4 cup vegetable broth (use less and add more if you need it!) until smooth. Meanwhile, cook pasta according to package. Drain and set aside. 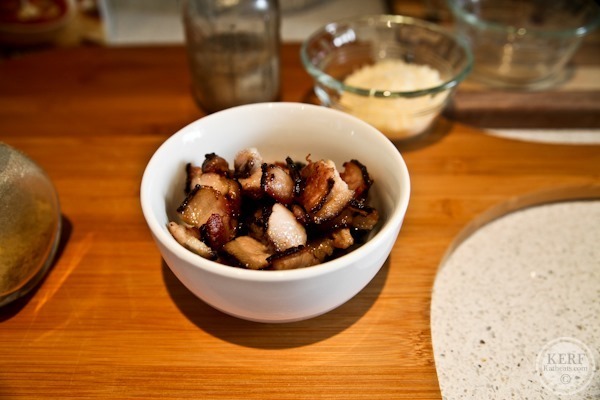 Cook bacon in a medium high skillet. Remove and set aside. Pat shrimp dry with paper towel. Cook shrimp in bacon grease on medium heat until brown, about 2 minutes per side. Set aside. Add garlic to same skillet over low heat and cook for about a minute, until fragrant and brown. Add 3 cups of butternut puree (you will likely have a little extra leftover if you made your own). Add paprika, Parmesan, nutritional yeast, nutmeg, salt and pepper. Add pasta and toss into the sauce. Transfer pasta into serving bowl or dinner bowls and top with shrimp and bacon. 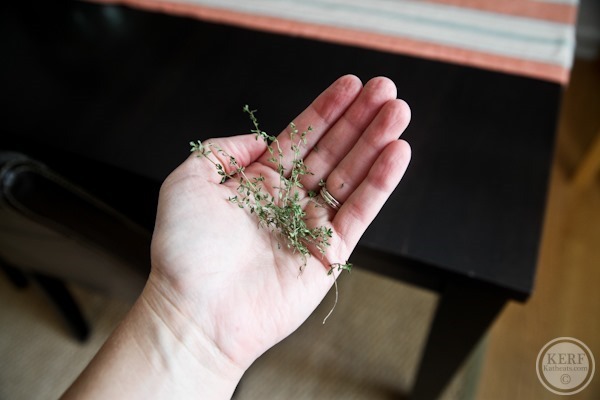 Garnish with any fresh herbs you like, if you choose. To win a Cuisinart Elemental 8-Cup Food Processor for your own kitchen, leave a comment with your favorite shrimp pasta recipe and follow our social media accounts for extra entries. There are more giveaways on the Eat Shrimp Facebook page so head there for more chances! Thanks to The Shrimp Council for sponsoring this post. This looks unreal, Kath! 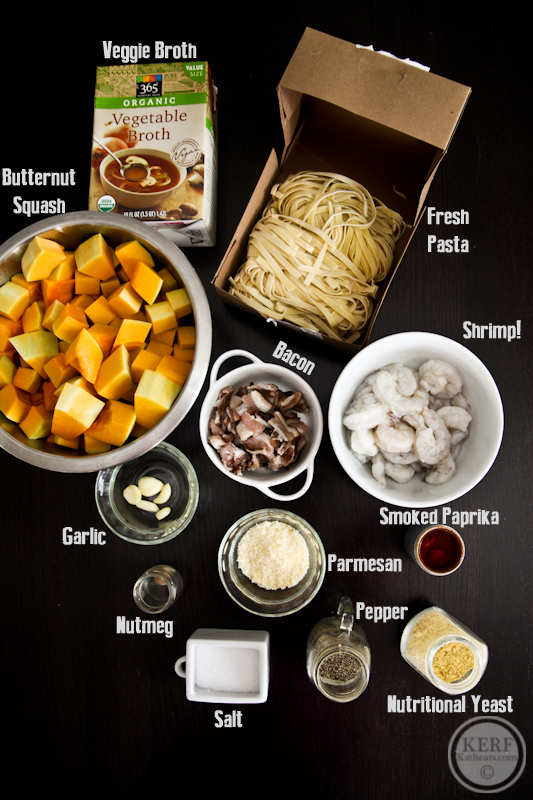 I love shrimp and butternut squash, so I’m salivating at the thought of this. My favourite shrimp and pasta dish is pad thai! I have been thinking of adding shrimp back in to my diet…but I’m still not sure I can do it! I recently made a pasta sauce using winter squash as well and it turned out amazing! Usually I prepare squash in sweet ways but it’s so nice to use them in savory dishes as well! So yummy. This looks awesome! Awesome recipe! I will absolutely be making this soon, perhaps this weekend! Hi Kath, I’m curious about your cooking method for the squash. I’m in Australia and for as long as I can remember, the advice from our nutritionists has been to steam vegetables wherever possible rather than boiling them, to retain maximum nutrients. I know you did use some of the cooking broth, but it seems to me a lot of the vitamins would still be leached out and antioxidants destroyed through a 15-minute boil. (I wouldn’t boil any vegetable for that long apart from potatoes.) I know nutritional content is important to you, so it seemed an unexpected cooking choice. Is the different technique a cultural difference, or has the scientific wisdom changed? Thanks in advance! You are correct and steaming would be fine too. Just get that squash tender enough to puree! I was thinking if I made this, I’d roast the squash! I didn’t just to save time, but I think it would be delish! Shrimp scampi over angel hair pasta is my fav. I love gumbo with lots of shrimp in it. So very good! I love this recipe too! Shrimp stir-fry! But this looks pretty tasty! Shrimp pasta jambalaya style w/spicy andouille sausage. Penna ala vodka with shrimp! Love butternut squash… And bacon,, definitely making this!! Does shrimp and grits count? If not, Angel Hair Pasta with Shrimp and Lemon Cream Sauce! Oh my! Looks delicious. Do I need the nutritional yeast though? or can i substitute? Love bang bang shrimp !! I love shrimp scampi. Butter, garlic, and shrimp? Can’t go wrong! My family loves shrimp Alfredo. The last time I made it, I actually made the noddles from scratch. It was really good. Still trying to master the sauce from scratch. This recipe looks delicious. I love the versatility of shrimp. I usually just toss an assortment of whatever vegetables I have on hand with shrimp, olive oil and a fresh herbs. This dish looks so tasty, can’t wait to try it!! Not really a pasta dish, but I like eating shrimp with spaghetti squash. My favorite shrimp dish is shrimp and grits! Years ago I found a recipe in a Southern Living magazine that used poblano peppers and bacon and it is a perfect compliment to shrimp! My favorite shrimp pasta is Shrimp Scampi! Shrimp, pasta, peas in a pesto sauce is my favorite dish! Sounds good! I need to try nutritional yeast as I love cheese sauces but would like a way to make it healthy. Oh wow, this looks and sounds A-mazing! I rarely make shrimp, since my hubs won’t eat fish or seafood, but there is this lemon-yogurt pasta (better than it sounds ;)) I make that I will occasionally add shrimp to. Pioneer Woman has an awesome shrimp curry dish that I am obsessed with – I swear I make it several times a month. I love shrimp – it is so versatile! Going to try this with pumpkin sauce. Looks yum. Oh, my favorite is definitely pad thai! 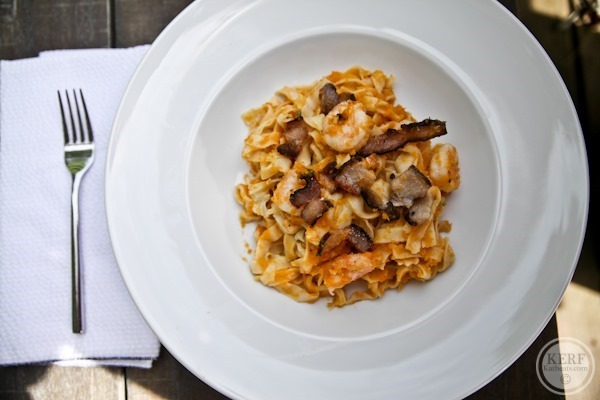 Love any fresh pasta with vodka sauce and shrimp. The thought of it is making my mouth water as I type! Love shrimp chopped into a fresh salsa! Delicious. 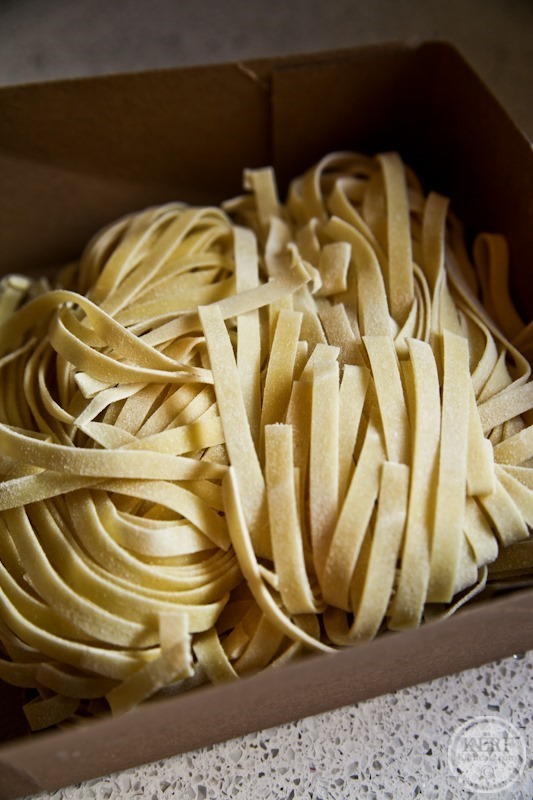 Did the fresh pasta come from Mona Lisa? Just whole foods, which is not nearly as good as Mona Lisa. Now I’m craving theirs! This dish looks fab! I also love shrimp scampi. Shrimp & broccoli mac & cheese! a shrimp stir fry with a ton of veggies is a favorite of mine. Shrimp caprese is my favorite shrimp/pasta dish. My favorite shrimp pasta dish is one that has shrimp, linguini, whole crushed tomatoes, and feta cheese. It is so good! I am about to be in my first apartment and am looking for a good food processor! Have you enjoyed this one so far? Yes i love how lightweight it is! My favorite shrimp pasta dish is shrimp scampi with linguine. Although this dish looks like it could become a favorite!! Just bought my first butternut squash of the season and have been loving in it salads all week. LOVE how this looks, can’t wait to try it out this weekend! I’m not a shrimp fan but I will definitely share this with my friends who are! Thanks! I’ve always liked Shrimp DeJong. doses the sweetness from the squash come through in the flavor? I was thinking I wanted more savory due to it being a meal with shrimp and pasta. I love Nutritional yeast so this looks great! I love simple grilled shirimp with Greek Seasonings on them…. Spicy roasted red pepper sauce over whole wheat penne topped with shrimp!! I love making a simple Mediterranean shrimp pasta dish, saute shrimp in olive oil and lemon juice and toss with fresh tomatoes, wilted spinach, crumbled feta and kalamata olives. Oh man, I can’t wait to make this dish! I love shrimp, bacon, and butternut squash!! My favorite shrimp dish we have been making recently is homemade shrimp fettuccini Alfredo with broccoli and scallops. Yumm!! You can never go wrong with Shrimp Scampi! I love me some cajun shrimp pasta! What a perfect autumn dinner! Will be making soon. I love making a greek-style shrimp scampi, with lots of lemon, feta, and dill. But can’t wait to try this one! I like shrimp with a healthy fettuccine sauce made with laughing cow cheese and sour cream! Shrimp Linguine…this looks so good! Gluten intolerance means little to no pasta for me but I love shrimp with spaghetti squash in place of pasta loaded with garlic, olive oil, red pepper flakes, spinach and parm on top! I have a Cajun shrimp and pasta recipe that is delicious! Love just a simple shrimp pasta with garlic & olive oil! Shrimp scampi with angel hair pasta! Its gotta be shrimp scampi! My sister makes a squash mac and cheese- I will have to try this! Adore shrimp quesadillas served at Mexican restaurants. I know its not the most healthy but bang bang shrimp will always be a favorite! Cajun shrimp and quinoa bake!!!! I guess *this* is my favorite shrimp pasta recipe, since I don’t have any shrimp pasta recipes! Every time you have a giveaway, I’m reminded that I never see a followup congratulating the winners! I hope all the giveaways actually happen! 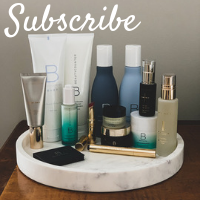 There are so many of them, but as far as your readers are concerned, entering is like throwing a note in a bottle into the ocean – that’s the end of the story. Roasted shrimp with orzo, tomatoes, garlic… Any pasta plus shrimp is great for me! my mom makes a great bowtie pasta, shrimp and broccoli dish with a light cream sauce (also good with salmon and peas)! I think shrimp scampi is the only shrimp and pasta dish I’ve ever tried! I do think your recipe looks awesome. I would just make it with no meat or maybe do chicken instead. You can’t go wrong with shrimp scampi! I like good ‘ol fashioned steam and peel shrimp. We steam it with lots of old bay, onions, and beer. Its AMAZING. I had shrimp coated in hot wing sauce in Louisiana — best shrimp of my life, so far! Shrimp scampi is my favorite shrimp and pasta dish although I like shrimp stirfry better 🙂 Who am I kidding? I love all things shrimp (and pasta)! I love shrimp, but not so much pasta. I do love butternut squash though. I cut it and roast it. I can eat a huge squash myself! I also roast the seeds. I am allergic to shrimp but that dish looks amazing. I make something similar with sundried tomatoes, butternut and pasta. Love a shrimp pesto pizza!! Love shrimp Alfredo (homemade of course!) or just shrimp with linguini and a little parmesean cheese and lemon juice! I don’t eat shrimp (vegan), but I LOVE butternut squash! I’m going to recreate this recipe soon! Shrimp and pasta is pretty much my favorite combo! I make a scampi like pasta dish that is pretty darn good. Shrimp and peas with garlic and white wine. Shrimp and Grits isn’t technically a Shrimp Pasta dish but nothing beats a bowl of S&G from The Carolina Inn in Chapel Hill, NC! I love shrimp in a spicy marinara sauce! Love this recipe Kath – you do a great job of creating simple, but gourmet-looking meals! I love shrimp with whole wheat linguini, fresh arugula, Parmesan cheese, lemon, and Olive oil, with toasted pine nuts. I love angel hair pasta with shrimp and a lemony white wine sauce. Delicious! This looks soo delicious! Can’t wait to make it. And the cuisinart looks fancy- would be a fun addition to my kitchen! 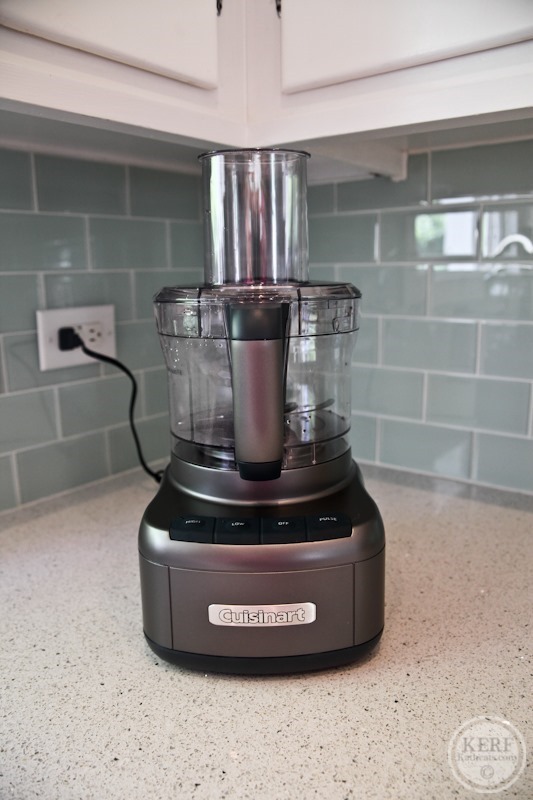 I have a Cuisinart mini chopper that I love and use for all sorts of recipes, but now with a family I find myself needing a full-scale food processor. The 8-cup would be such an awesome Xmas present to myself! Thanks, Kath! Love vegan butternut squash mac & cheeze! I’m a shrimp cocktail fan, especially with homemade cocktail sauce. just a simple dish of shrimp and spaghettini with lemony dressing, but i also love seafood linguini! As a girl originally from Baltimore, I need Old Bay on my shrimp. I like to make a creamy shrimp pasta dish that includes old bay, kind of like shrimp salad with pasta! Also, tarragon and lemon is always nice with shrimp if I’m making something lighter. This looks like an excellent fall dish! I love this idea. I always struggle to put butternut squash into other dishes. I will definitely be trying this! I like it simple. Angel hair pasta tossed with some oven roasted shrimp, olive oil and parmesan cheese. A little salt and pepper to taste and it’s perfect. This dish looks amazing. I love butternut squash and shrimp but would not have thought to pair them together. Favorite shrimp pasta dish a one that I make with bacon and lemon. 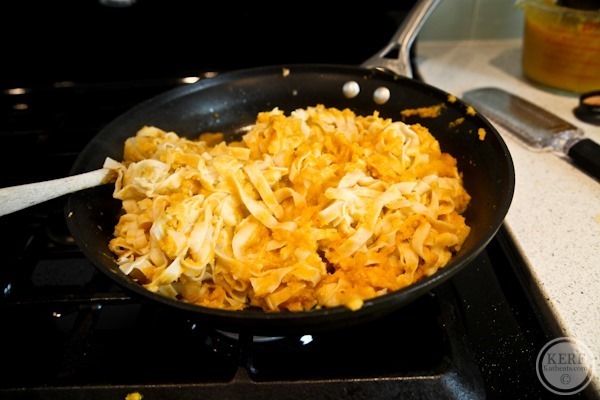 Omg – in my world, butternut squash and pasta are best friends! But usually the pasta was on the outside and the squash was the filling…now it’s the squash’s turn to embrace the pasta! 🙂 Shrimp is just a bonus addition to the party that will be happening in my mouth! But my favorite shrimp pasta dish is probably shrimp added to fettucini alfredo! I love shrimp,scampi, but this recoe sounds amazing! shrimp over pasta with garlic and olive oil and red pepper flakes. just the basics. Oooo my favorite vegetable (or fruit for the seeds)! I have never used nutritional yeast and dairy cheese together. I bet it would taste good with Kabocha too! I love a simple shrimp with pasta. shrimp scampi! but really shrimp in anything is amazing! Last week I made Bobby Flay’s shrimp and cheesy grits with bacon. Amazing! I will definitely give this recipe a try. I have a butternut squash on my counter that I need to use up and my kids love shrimp and pasta. I’ve actually never made a shrimp pasta! My favorite in a restaurant was a shrimp pasta with a vodka sauce. I just love shrimp that’s properly seasoned and steamed just right! Not overdone, not underdone. Strangely enough, my blue collar boss does it best! At our annual work cookouts his shrimp is THE STAR! My favorite way to eat shrimp is cold with cocktail sauce – nothing fancy! Pesto pasta & shrimp is delicious! 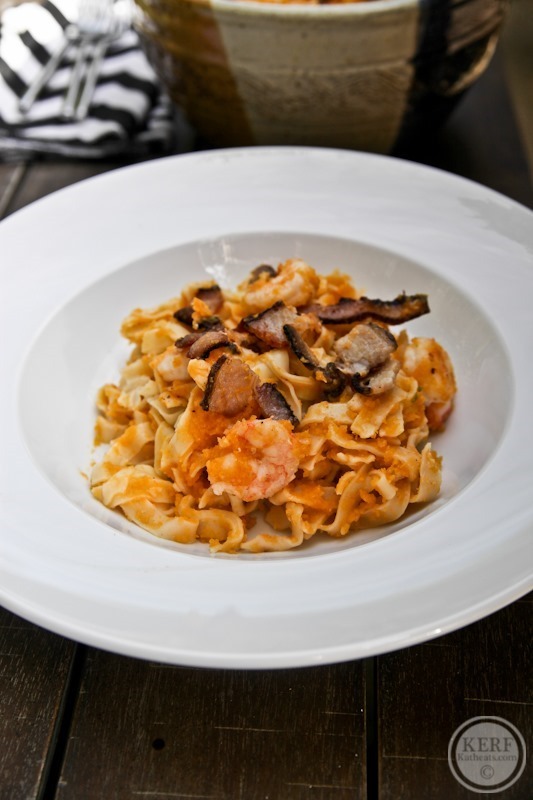 I love a spicy shrimp pasta dish like shrimp fra diavolo! Scampi is my fav too! Shrimp and angel hair pasta with lemon sauce. I love shrimp with basil pesto! My favorite is a shrimp pasta bake with feta cheese! It’s not pasta but I we love shrimp fried rice! This isn’t my all-time favorite but it’s the easiest! Pound of cooked pasta. Pound of shrimp sauteed in some butter. Add warm vodka sauce to the shrimp and serve over the pasta. Done! And delicious. Shrimp Parm with fresh Mozzarella! Sometimes it’s difficult to know what is the healthiest and most ecologically friendly purchase to make when buying shrimp. I use Seafood Watch as a reference, but was wondering if you have a specific recommendation. Thank you for your recipe- looks delicious! I look for wild caught USA (per Seafood Watch – love them). I can usually find some fresh and frozen at Whole Foods from the US. Shrimp, pesto, pine nuts, olives, sun-dried tomatoes, baby spinach, and goats’ cheese. I actually love this on a pita and grilled in the oven, but it’s also fantastic over pasta! Oh gosh, I don’t think there’s many ways I don’t like shrimp! 🙂 I don’t like it in a red sauce, as it gets overpowered. My favorite is probably fettucini alfredo with shrimp though. But you can’t beat them sauteed. Alaska (where I live) has amazing shrimp! At my house, we like to make a shrimp dish with penne pasta, asaparagus, parmesan and sometimes bacon! I haven’t had a shrimp dish in quite some time, but I used to love the shrimp scampi at Olive Garden 🙂 This looks amazing though! Yum, this looks amazing! 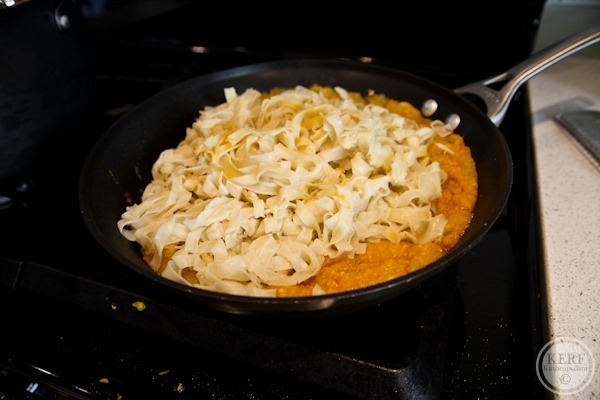 I love butternut squash – can’t wait to try this at home! My roommate has a mini food processor and I recently used it to make twice baked thai sweet potatoes with shrimp. I could definitely use a bigger food processor though! I love Ina Garten’s baked shrimp scampi. It’s so good! Spaghetti aglio e olio with shrimp and asparagus. Grated myzithra to finish! This looks delicious. We make a shrimp pasta dish with tomatoes, butter and garlic that is wonderful. Thanks. I am super into red curry lately and have started making my own with shrimp. So good! I love shrimp and any kind of pasta! This recipe looks amazing! My favorite shrimp dish is my mom’s Shrimp Poblano Chili. Yum! I’ve never had a shrimp pasta dish before…and I live in New England!! I love combos like shrimp, avocado, and pasta. So many great flavors! I love penne and shrimp with vodka sauce. I love shrimp but gave it up for years because of the terrible bycatch issues associated with the industry. That is until I learned about the Oregon bay shrimp industry’s sustainability awards. Bay shrimp are tiny, but I’m sure they’d still be delicious in this recipe! I eat a plant-based diet so I make a delicious vegan version of this butternut sauce and add broccoli over pasta. It is my daughters’ favorite dish! Actually…I hate shrimp…ha. Wish I liked them, but I do love making pasta with a squash sauce. 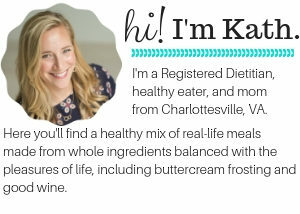 There’s an Ellie Krieger squash mac n cheese I really like. I love shrimp fra diavolo! Can’t wait to try this! Looks so good. favorite shrimp dish is just simple boiled peel n eats with the old bay seasoning! this recipe looks so delicious! shrimp on a cobb salad! I use an Amanda Hesser recipe for pasta with creme fraiche and meyer lemon. Grilled shrimp on the top is amazing. I’d love to win the food processor, and use it for pumpkin. This looks delicious! Love shrimp with angel hair pasta and red chili flake/white wine butter sauce. Onions caramelized till sweet and syrupy, squeeze of lemon and some goat cheese. Garlic buttered noodles and grilled shrimp. My fav shrimp pasta dish is shrimp scampi!! I had it for the first time when I was a kid in Jamacia (lucky!) and I have loved it ever since. I love shrimp fra diavlo! Hi Kath 🙂 Love shrimp plain but personal fave is making my own salsa with canned tomatoes, red onion (I know what you are thinking but you can’t taste them really! ), green peppers, balsamic vinegar, soy sauce and garlic and tossing the shrimp and some spelt pasta in the salsa. MMMMMM! Yummy and simple 🙂 Keep up the awesome recipes! I loooove Cook Smarts Pesto Spag with Shrimp! Shrimp Scampi, this recipe looks easy and yummy. My dad would love this recipe! I must send it to him. I love coconut shrimp. This dish looks really good. What a great recipe – can’t wait to try it! I adore a good shrimp scampi. I love the combo of squash and shrimp! I never would have paired it! 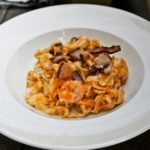 As far as recipes go, any pasta with shrimp and a light sauce (scampi, especially) is a win in my book! I love lemon and garlic grilled shrimp over zucchini noodle pasta in a light pesto! Hope I win!! Usually garlicky angel hair pasta with red pepper flakes and shrimp is a winner! This recipe looks really good – I will have to try soon! My favorite shrimp and pasta dish is Pad Thai. Yum! any dish i can just throw in a bowl with lots of herbs is divine! Yum! This looks delicious. My favorite shrimp recipe is a shrimp scampi, but I really like this fall dish with butternut squash. Shrimp scampi is definitely my favorite shrimp dish. I love Martha Stewart’s One Pan Pasta Recipe, and I add shrimp and pesto….super easy and so good! my favorite shrimp pasta dish is just shrimp, any kind of pasta and pesto!! 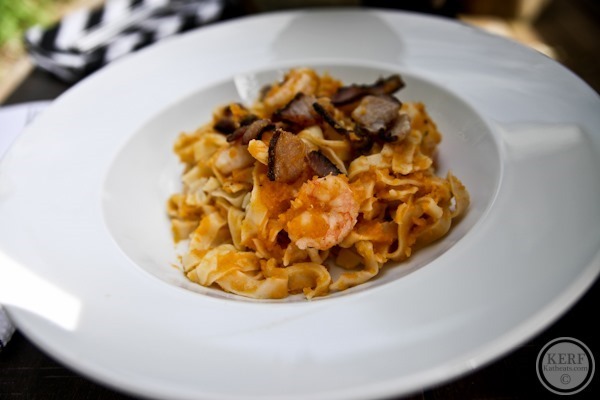 my favorite shrimp pasta recipe is an improvised one that i created based on shrimp scampi! Your recipe looks delicious! I can’t wait to try it this weekend! Shrimp scampi is definitely my favorite shrimp pasta recipe. My favorite pasta dish is my family’s Clam Spaghetti recipe, a lighter white sauce with garlic, onions, parsley, clams and lots of parmesan! My mom adapted it from a cookbook decades ago and it continues to be our family’s go-to pasta recipe. Baked shrimp with feta & tomatoes served over angel hair. Yum! How can you beat shrimp scampi? Yum! My current favorite shrimp recipe is a bang bang shrimp copycat that I found. It’s seriously identical to Bonefish. I love shrimp scampi and bang bang shrimp yum! At the moment, this looks like my favorite pasta dish even though I haven’t tried it yet! Anything with butternut squash and cheese is up my alley! That sounds so tasty! My mother-in-law made this delicious shrimp, angel hair, butter, garlic thing last time we visited; so good! shrimp scampi over angle hair pasta,any thing shrimp I would eat & I’m am going to try this one!! This looks delicious, Kath! I always roast my squash before trying to slice and dice because I fear for my fingers! How do you cube before cooking? Very carefully! Smaller squash are easier for me to cut. But it’s never easy! What might be another protein to use if I don’t like shrimp? Do you think another seafood like scallops or salmon would work, or should I stay safe and just do chicken? Thanks! I think all of the above would work! Shrimp and Grits is my favorite! It’s shrimp fra diavolo for me. I’ve never had shrimp in my pasta, but I expect I’d enjoy it with a tomato-y red sauce, spinach, bell peppers, and linguine. I have yet to find a shrimp dish I don’t like! I love them all! I used williams and Sonoma squash puree and scallops, as they were on sale, and it was delicious! A great fall pasta dish. I make a great mushroom ragu over spinach pasta- but no shrimp since i’m vegetarian. shrimp with homemade cilantro pesto and grilled veggies- super fresh! I love shrimp fried lo mein noodles with a side of miso soup! Ooooh, perfect timing — we just decided we needed to replace our food processor because the slice/grate blade doesn’t work at all (we would just replace the blade, but it’s an old, cheap model and that feature never really worked well). We do lots of purees with squash from our garden. Fingers crossed! Shrimp and linguine with pesto! Basil, shrimp, and zucchini pasta! New Orleans style Barbecue Shrimp! My favorite shrimp pasta has always been alfredo, but I’m excited to try this and see how it compares! This looks delicious – must try soon. What software do you use to create the beautiful picture of your ingredients with the labels? Normally not the biggest fan of squash, but this looks good with the parm, bacon and shrimp Going to have to try this soon! 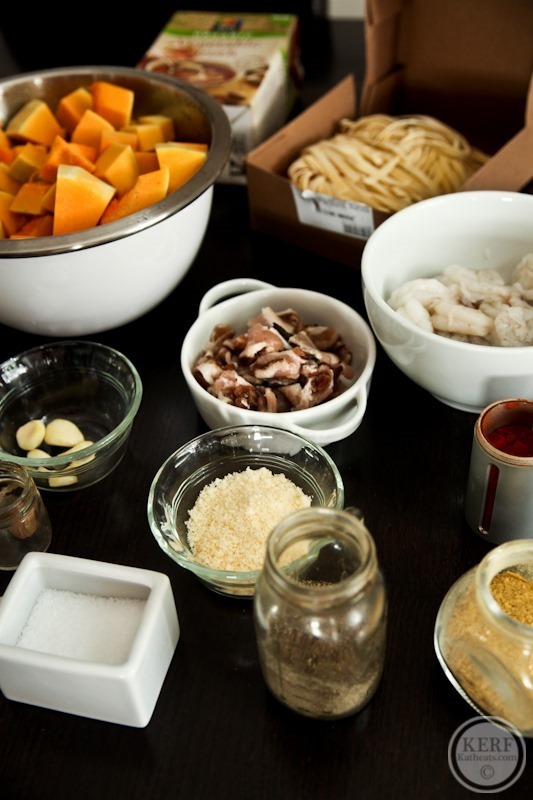 I love shrimp in pasta, and I love butternut squash in pasta, but I never thought to put them together! Great idea!! Can’t wait to try it. Love shrimp but I’ve never cooked them for some reason. This recipe looks great! I LOVE the combo of pumpkin, bacon and thyme! Yum! !